Over the last decade, the manner in which businesses develop and market their brand has evolved immensely. The rapid expanse of the internet, and the emergence of social media in conjunction with the rapid advancement of communications technologies, such as smartphones and tablets, has placed businesses in a situation in which developing a web presence is no longer optional. Additionally, the fact that over 80 percent of consumer searches are conducted on mobile devices demands that your company’s website be able to accommodate mobile devices, while still providing an optimal experience from those shopping via desktop computers. Initially, many companies responded by using multiple sites to engage their customer base on multiple devices; however, responsive web design has provided a solution in which the site can detect the devices being used and adapt accordingly in order to provide the optimal customer experience, regardless of the device being used. Responsive website design is a design approach in which the layout and coding of a website allows the site to adjust its layout to provide the optimal viewing experience no matter the size of the viewing screen. Additionally, different websites will have different requirements and needs, being expressed in features and functionality. Responsive / mobile friendly website design provides the most lucid path to the fulfillment of these needs and requirements. At Awebco, companies are able to work with site designers and coders to ensure that their site will perform in exactly the manner that they need it to. 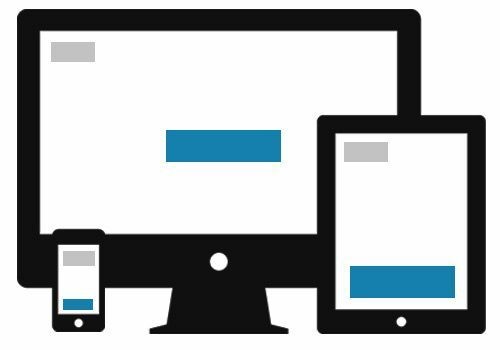 Not only does the design of a website have to accommodate the usage of multiple devices by different customers, but it must also respond to the use of multiple devices by a single customer returning to the site. A customer my visit the site using a laptop, and then revisit the site using their smartphone. What this means is that the site must not only respond to each device, but it must provide an equal user experience each time. Responsive website design services offered by Awebco are capable of meeting the challenge of multi-device users. Take advantage of being able to rank higher on Google in Illinois & Indiana with responsive website design services from Awebco and reach the customers looking for you on all of the different devices they use. As technology continues to dictate how consumers access web content, site owners will have to ensure that their sites have the capacity to respond to the constantly changing devices through which they will be accessed. Allowing Awebco to design and develop your responsive design site could be what puts your business out front. A huge part of developing a web presence is creating the ability to attract organic traffic — traffic that did not arrive on your site via some form of advertising. The primary way this is accomplished is by using SEO strategies to ensure that your page ranks high when be people conduct searches associated with the services or products you offer. The major search engines like Google and Bing place a great deal of emphasis on a site’s ability to deliver a positive and relevant experience, and they set their algorithms to respond to sites that have a responsive design. Google also adds a mobile-friendly tag to sites that have responsive design, ensuring that users will be able to distinguish between the sites that can provide the experience that they are looking for, and those that cannot. When consideration is given to the work that goes into keeping one site updated and curated with relevant content, it is easily understood why businesses prefer the responsive design over using multiple sites for each device. Your website is one of your companies most powerful weapons in propagating your brand message, while remaining engaged with the customer. The mobile-only approach, served the purpose of being a temporary solution, but the responsive design is not as burdensome and tedious as attempting to manage multiple sites, while presenting identical messages.